A campsite is probably not your first thought when staying in the Caribbean. It wasn’t mine either. 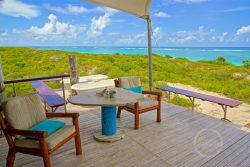 Looking for an exclusive accommodation in the equally exclusive Anegada, I found out about Anegada Beach Club. A five-star glamping with luxurious tents. An exclusive experience that I love to tell you about. Holidays usually begins with anticipatory pleasure. Finding your dream destination and accompanying perfect accommodation. 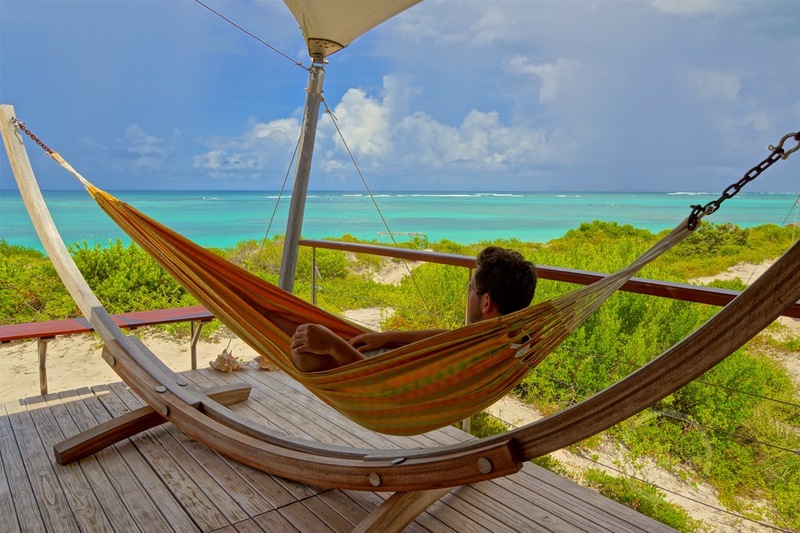 I arranged my stay directly with Anegada Beach Club, a real glamping in the Caribbean. The website offers a simple reservation module which also displays the current availability clearly. From the start my mail contact later on with owner Jamie was pleasant. She immediately gave me tips on how I could get to Anegada (which I had not thought about at the time of booking , see article “How to get to Anegada, British Virgin Islands?“). She also arranged a rental car for me and she ensured me that we were personally being welcomed. That promise wasn’t a lie. After a short but very adventurous flight from Tortola via Virgin Gorda to Anegada, we were welcomed at the airport and picked up by the taxi driver of Anegada Beach Club. Now that’s a relaxed start of your stay! About 20 minutes later we arrived. It was an easy drive. Anegada is flat as a dime and has a population of only 250 people, some cows, donkeys and flamingos. You might understand that it was very quiet on the road. But I’ve to confess that it was September the time we visit the island, one of the quietest months in the Caribbean. Once arrived we were welcomed very hospitable. Because of our first flight, we arrived very early at Anegada Beach Club. Meanwhile our tent was being prepared, we enjoyed a delicious a la carte breakfast. The fried eggs were delicious! Moments later we were brought to our tent. Of course I had reserved the most luxurious one, so my expectations were high! Anegada Beach Club offers a number of suites situated at the pool, near the outdoor restaurant. The real eye-catchers you’ll find in the dunes. 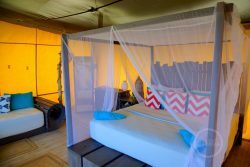 Luxury tents with all amenities including king-size bed and all offering ocean view. 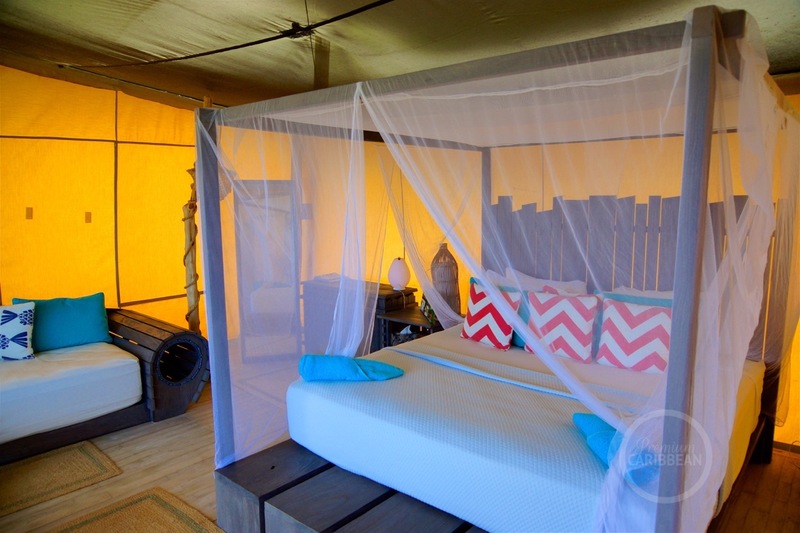 There are even more luxury tents situated directly on the sea, which comes with two outdoor bathtubs on the sundeck. After a short walk through the dunes, we arrived at our tent. Our luggage was already brought to the tent by the staff. Words cannot describe the views of the white sandy beach and the Caribbean Sea. The tent is fully equipped: a king-size bed, seating and storage space for your stuff. The rain shower can be found in a separate wooden cabin next to the tent. Outside the great sundeck offers you a sitting area, a large hammock and, in our case, two bathtubs in the open air. Fantastic! I already wrote that September was the time of our visit, a very quiet month in the Caribbean. It didn’t bother us, because we already had a large part of a pretty active vacation behind us. How decadent as it sounds, island hopping is hard work! A stay at Anegada Beach Club was a perfect end of our holiday. Two nights ahead of us on an island which seems to be uninhabited. 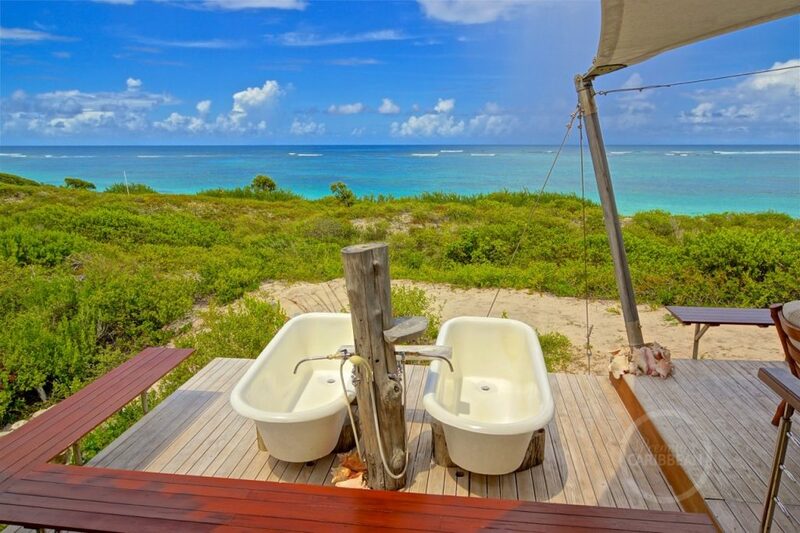 From the kingsize bed in the tent, the outdoor bathtubs or from the hammock you have views of miles of white sandy beaches and turquoise waters of the shallow reefs off the coast of Anegada. You feel like you’re in paradise! At night you will be treated to a sky full of stars and if you’re lucky you even can spot the milky way. It made me speechless, so wonderful. Anegada is known for its lobsters. 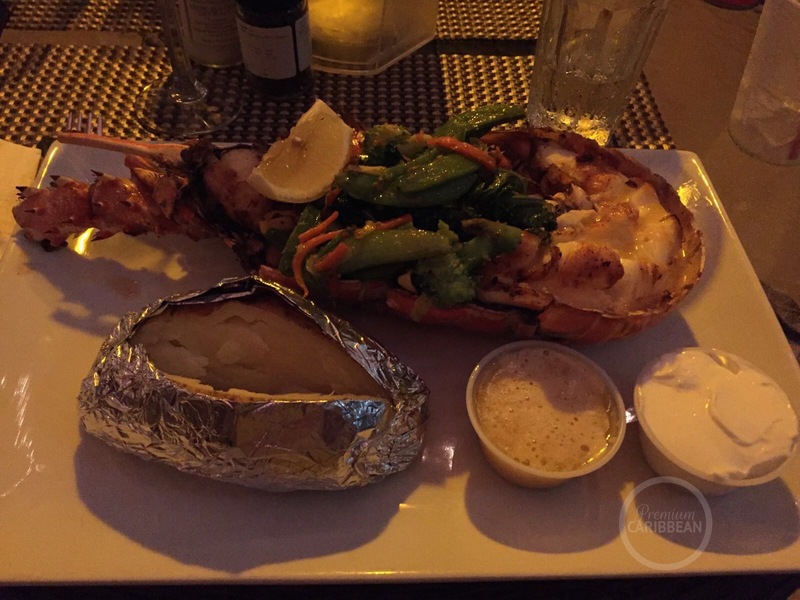 These are freshly caught and served here on the island and the surrounding Virgin Islands. 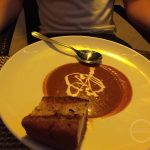 Obviously Anegada Beach Club offers this delicacy as well. As a starter as bisque and a main course to choose as whole or half lobster. Both dishes were divine! The next night I’ve had the lobster in combination with pasta, again very tasty. 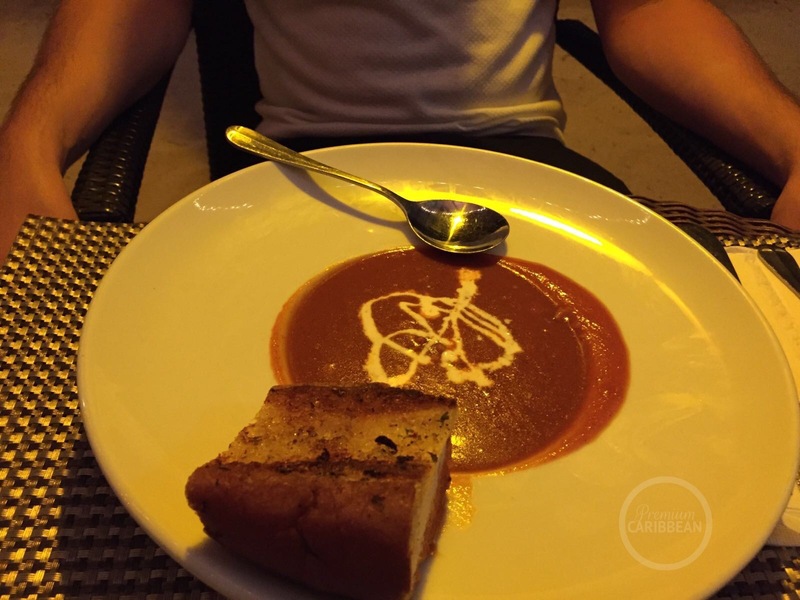 Tip: if you go for the bisque, do realize that a large portion nearly fills as a main course! If you have never eaten lobster (just like me before I came here), please do not worry. The chef is ready to help you how to eat lobster. Keep note that the restaurant wants to know in advance (before 4:00 pm) what you would like to have for dinner. This is due to the limited and costly supply of stocks on the island. As I told you earlier, Anegada is thinly populated. Furthermore it’s quite a remote island comparing to the other Virgin Islands, which makes it even more a challenge to supply the island. I have not experienced it as annoying anyhow. On the contrary, you feel even more special to be one of the lucky few who’s able to visit this exclusive little gem. Usually throughout the year there is a constant stiff breeze on Anegada. At the time of our stay it was windless. This was due to a hurricane hundreds of miles away which pulled away all the wind from the immediate vicinity. As a result is was very hot in Anegada during the day. Normally the strong north-easterly wind is taking care for some coolness in your tent, now this was not the case. However, there is still a fan to keep it somewhat comfortable. Also a major disadvantage of calm winds is the emerge of sand fleas. A little adventurer will not perceived these matters as an obstacle. In fact, everything was perfect during my stay at Anegada Beach Club. The outdoor experience of the tent, its breathtaking views, the serenity but above all the ultimate luxury feeling. The staff is incredibly friendly and helpful. They are continuously able to be ready for you when you need them and at the right moments they keep a proper distance. Both breakfast, lunch and dinner were fabulous. A big plus is the a la carte ordering. 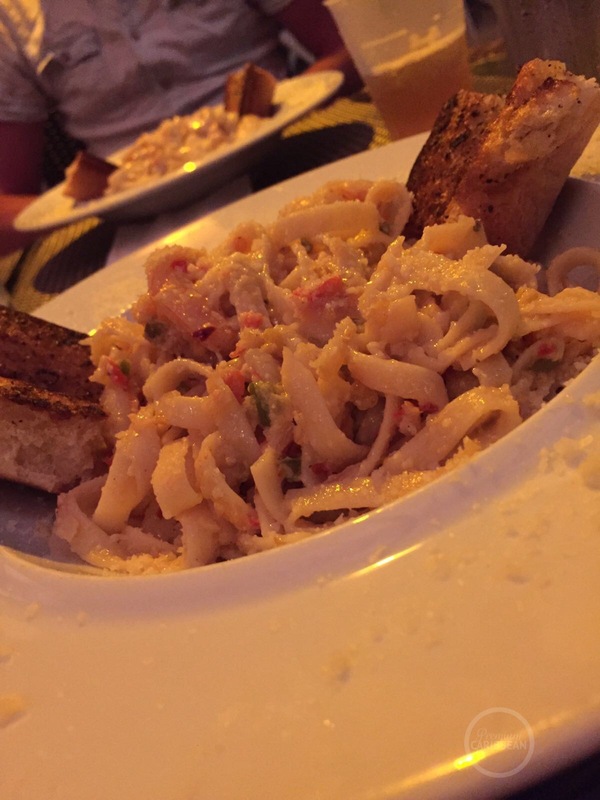 Despite the challenge of the limited supply of Anegada, you will not get hungry here. I can strongly recommend a stay at Anegada Beach Club and I will most definitely return in the future. Want to book this great accommodation as well?